河口信夫. :人間行動理解のための装着型センサによる大規模データベース構築にむけて, 情報処理学会マルチメディア分散協調とモバイル(DICOMO 2010), pp.579-581, 2010. Kawaguchi, N., Ogawa, N., Iwasaki, Y., Kaji, K., Terada, T., Murao, K., Inoue, S., Kawahara, Y., Sumi, Y. and Nishio, N.:HASC Challenge: Gathering Large Scale Human Activity Corpus for the Real-World Activity Understandings. Proc of ACM AH 2011, pp.27:1-27:5, 2011. Ogawa, N., Kaji, K. and Kawaguchi, N.:Effects of Number of Subjects on Activity Recognition - Findings from HASC2010corpus. 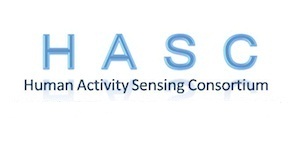 Proc of 1st International Workshop on Frontiers in Activity Recognition using Pervasive Sensing (IWFAR2011), pp.48-51, 2011. 河口信夫, 小川延宏, 岩崎陽平, 梶克彦, 寺田努, 村尾和哉, 井上創造, 川原圭博, 角康之, 西尾信彦. :HASC Challenge2010 :人間行動理解のための装着型加速度センサデータコーパスの構築, 情報処理学会マルチメディア分散協調とモバイル(DICOMO 2011), pp.69-75, 2011. 小川延宏, 梶克彦, 河口信夫.:HASC2010corpusを用いた被験者数と人間行動認識率の相関分析. 情報処理学会 マルチメディア 分散 協調とモバイル (DICOMO 2011), pp.76-82, 2011.